My father passed away last week. He will always remain a very special man to me and I have many many fond memories to look back upon. He will be sorely missed by many. "Don't worry about trying to fill my shoes. You have your own shoes to fill." I will never forget these words that I heard from my father about 15 years ago. I had recently become employed by the Community Guardian Company, an organization that my father had worked for some years earlier. He had since moved on to other employment. While at work, I had met a man who had known my father when he was employed with the same company. This man had indicated to me that my father had been a great help to him, and I listened to his recounting of his memories of my father. To be honest, I felt somewhat intimidated by this. I felt that I was about to be measured against the performance of my Dad. I called him on the phone and after telling him about the conversation I had, I said, "Dad, I don't think I will ever be able to fill your shoes." Of course, as usual, my 'auld man' had very wise words of advice and encouragement for me. Sometimes, growing up, I hated my dad's words of advice. More often than not though, I discovered that his wisdom was well worth heeding. Isn't that generally the case of sons that have great fathers? My father passed away 4 days ago, on January 10th. I know that time is the best healer, but I also know that I am going to miss him more and more in the future. You see, my Dad was truly the best Dad that one could ever have. He was certainly not perfect, and he made mistakes, but I know he loved me. My dad was a deeply spiritual man and had a strong faith in God. I know that he would not have approved of this, if he knew it, but up until the age of about 14, to me, my Dad was God. My Dad seemed to know everything that was worth knowing. Even after I realized that he was not God, I still figured he was the closest thing. My father was born in Northern Ireland, and as a youngster, enjoyed some great fishing (both fly and spinning) in the rivers and lochs of that country. When we immigrated to Canada, fly fishing was not very well known in the parts we lived in, but my Dad would take me out to rivers where we would sit together, catching catfish, perch, and the odd bass. For me, his love of the sport was contagious. I loved spending time with my Dad, and fishing with him was the best. Looking back, I can say that my Dad had an abundance of patience with me. I can remember so often, my dad laughing while helping me get my hook unsnagged, or un-knotting the crow's nest that I had caused in my reel by my lousy casting. He never complained. He always helped. He did tease though, in his good natured way, and we'd both laugh while I looked up at the sparkle in his deep blue eyes. My father missed flyfishing. I can remember quite often, as we would sit together near the shore of some lake in the evenings, and watching bass rise, how he would tell me that it was unfortunate that very few anglers in our new part of the world knew what fly fishing was. He would tell me that he could guarantee that if we were using fly rods instead of casting spoons that we could catch some of those big bass that seemed more interested in hitting bugs on top of the water than what we were casting out to them. My dad knew what he was doing. He motivated a curiousity in me about this thing called 'fly fishing', something he had done years earlier in Northern Ireland, but not here in Southern Ontario. When I was about 9 years old, our family had only been in Canada for about 5 years. My Dad discovered from an acquaintance of his that there could be some great trout fishing in the Nottawasaga River, near Orangeville, Ont. 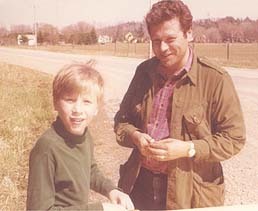 I still remember that Opening Day, the anticipation of going fishing with my Dad, and heading out with him to the river. The fishing was slow all day, neither one of us had caught anything, and yet, with my Dad, it did not matter. What mattered was the fact that I was with my dad. He was still God to me. He knew everything. He knew that I was going to catch something, if we didn't give up. Sure enough, late in the afternoon, I caught my first brook trout, about 12 inches long. I still remember my Dad's excitement, watching me catch that trout. It never mattered to him that he caught nothing that day. He made me feel as if I was the best fisherman that ever existed, and I loved him for it. My Dad had a wonderful tackle box. It had the 'smell' of a tackle box that contained lures, hooks, and tackle that actually worked and caught fish. As a child, I would go through that tackle box, looking at the lures he had in there, and tried to steal some of them. He knew. He watched me from a distance and then would give me some of his favorite lures. Then, he bought me a Mitchell 300 spinning reel. One day, as he and I drove through the town of Orangeville while on a fishing trip, we stopped in at a tackle shop and he helped me pick out my own tackle box, where I stored my fishing stuff the same way he did. He gave me even more of his own tackle, and threw in a 'Hockley Minnow Box', a small tin box that he had used for some years to store spoons and Devon Minnows, and I felt like I was the best angler in the world, being the owner of such excellent equipment. As I grew older, my dad would often spend time with me, both when we were fishing and other occassions, talking to me, teaching me how to think, teaching me to appreciate his Creator's creation, and always letting me know that I was his 'wee man'. Yes, there were times, as I grew older, when I disliked my father's advice, when I hated what he had to say to me, but I always knew he loved me and that he wanted nothing but the best for me. In recent years, my father had been ill with heart and kidney problems. Although he couldn't afford to spend the energy or the time out fishing, we would talk from time to time about heading out together for a few hours, fishing. Unfortunately, geographical distance made those planned trips something that would always happen in the future. Just recently, I had made plans to move closer to him and looked forward to being able to spend the odd hour with him this coming summer and spring on some streams and rivers local to where he lived. On Tuesday, January 9th, my dad was heavy on my mind. It had been 9 days since I last spoke with him. I had thought about him all day, and had been planning on calling to ask how he was, to tease him about something or other (my dad was a great fun loving tease himself), and to let him know how my own plans were progressing. I thought about watching my Dad, 9 days earlier, visit with my sons, his grandchildren, how he looked upon them with pride, how he joked with them and made them laugh. I smiled as I recalled my Dad finding a tin whistle, and pretending to play it as my 12 year old son Alex showed us what he had been learning in his band class, playing his trumpet. Things came up, and the phone call was never made. In the middle of the night, I received a phone call instead. It was my sister calling to let me know that my dad had possibly suffered a stroke. On January 10th, at 2:40 in the afternoon, I was present with the rest of my family as my father passed away. He had been in a coma up until that time. None of us could hold back the tears of weeping. A most special man, an imperfect man no doubt, but more importantly, a loving husband, loving dad, and a special friend had left this world. How I wish I had made that call on Tuesday. How I wish I had fit in one more fishing trip with my Dad. I still have so many things I wanted to tell my Dad, or ask his opinion about. I hope he knew in his heart how much I loved him. I hope he knew that even though we had our disagreements (my Dad and I loved to discuss things - everyone else thought we were arguing, but we were simply constantly sharpening each other's thinking skills), and that he was no longer 'God' in my eyes, he was still "The Man." I figure that any person who knows that I could not fill their shoes, but that I have my own shoes to fill, is probably one of the wisest persons around. Do you have a Dad? Go call him. Don't wait. I'm going to miss you Dad. Terribly. After talking to so many of those who attended your memorial service, and listened to their experiences and memories of you, I know that I will never ever fill your shoes. I can only hope that I fill my own as well as you overflowed yours.